And with this post, I’ve nearly reached the end of my little study on gender, Lost, and whether this show seems to punish its female characters more than male ones. In this post: quick bits on significant but minor Losers Rose, Rousseau, Alex and Cindy. As far as the investigation into whether women on Lost get screwed — as it is posited in this A.V. Club article — most signs are pointing to yes, as least with the major characters. But this final post isn’t focused on big-leaguers so much as it is on the superficially less important characters, many of which have proved quite influential to Lost’s plot. 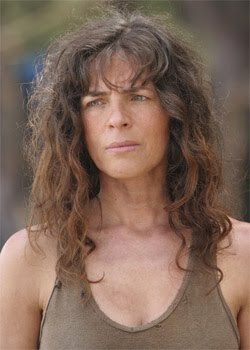 In many ways, these characters have done better for themselves than their more important counterparts, possibly because the writers felt more able to tweak these B-stringers and expand their roles beyond the narrow restraints of what it apparently means to be a female major player on Lost. Hit the jump for exciting minor character intrigue. 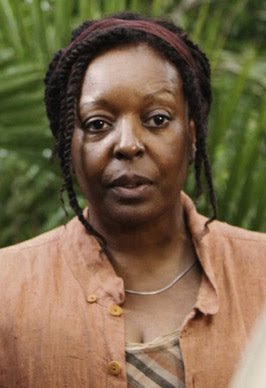 What could have been merely a stereotypical “mother hen” character has instead grown to be one of the most beloved characters on all of Lost, thanks to good writing and a nuanced performance by actress L. Scott Caldwell. It helps, I think, that Rose is also one of the only characters to receive what she wanted most: a reunion with her husband, Bernard. Often, characters on this show seem to be punished for unwavering, blind faith — see Ben, see Locke, see Richard Alpert — but Rose actually seems to have been rewarded for her belief that Bernard was alive and that she would be with him again. Rose is love. Rose is faith. Rose is hope — not only for other Losers but also for viewers that a happy ending is possible in the Lost universe. I mean, surely it’s significant that the writers created Rose as a woman who only remarried shortly before the crash rather than as a woman who had been married for decades. Just as Rose and Bernard found true love the second time around, a person can find their happiness no matter how late in the game, no matter how slim the odds, no matter how immediate the apocalypse may seem. Sure, Rose and Bernard are stuck on Four Toe Island, but they seem to have made their peace with it, at least according to the fifth season finale. But in addition to being the show’s epitome of love, faith, hope and probably other positive qualities, Rose is also something else: totally doomed. If she leaves the island, her terminal cancer could return. If she stays, she must spend her remaining life eating mangos and running from monsters. Even in the sideways reality, the best Rose gets is graceful resignation to her impending death. And while there is a certain honor in taking such hardship so well, it’s still an unavoidable bummer. That’s the big problem with Rose as a character: one of her greatest virtues is her ability to cope with how colossally she’s been screwed. She really could give the other girls on the island some lessons. For now, I’m going to call Rose a draw, though I have a suspicion that somehow she and Bernard will get another chance at happiness before the final episode airs. In some ways, Rousseau is one of the strongest characters on the show, since she managed to survive on her own in one of the most hostile environments on the planet. Of course, that strength is mitigated by substantial amounts of crazy, but she still survived longer than most. I have a problem with Rousseau, however: We’re supposed to believe she became this expert hunter and tracker, and yet she never managed to find her daughter, Alex — her sole reason for fighting for survival — during the sixteen years between her birth and the time Flight 815 crashed. Shouldn’t someone with Rousseau’s skills have been able to locate the quaint little suburb that is Dharmaville, where Alex was playing on swing sets while being raised by Ben? That’s less an analysis of gender than a critique of the show’s writing, I think, but here’s something more in line with this little series: Rousseau is oddly asexualized. Despite her status as a mother being so central to her character, she’s seen not so much as a woman but as some feral jungle creature lurking in the shadows. Even for the purposes of this article, I felt odd and wrong referring to her as Danielle. Nearly everyone on the show calls her Rousseau, perhaps because she lost a bit of her humanity and femininity during her years in solitude. Whatever works to keep you alive, I guess. In this line of thinking, it’s also notable that shortly after she finally finds Alex and once again shifts into motherhood mode, she dies. And she dies rather ignominiously — caught uncharacteristically off-guard when the freighter mercenaries storm through the trees. Bang — one shot to the abdomen and Sheena, Queen of the Jungle, slumps over, dead. A more cynical person would make a comment about how maternity distracts a woman from her professional focus. Overall, she’s a strong character though-and-through until the moments before she dies. A pity. She’s an entertaining character. She deserved a better send-off than she got. Like mother, like daughter: Alex Rousseau. I rarely identify with Ben Linus, that scummy little weasel. But I have to say that I completely shared his shock when Alex was executed in the fourth season. Despite the high stakes of Four Toe Island life, I never expected that she would die and join the Women in Refrigerators club. But, of course, one of the reasons I enjoy Lost so much is for its ability to surprise me. Though I tire of the trope of female characters dying horribly in order to give male characters a reason to mourn and then propel themselves in a daring new direction, I also feel that if characters are going to used in this manner, they should at least be done as well as Alex was. Her death shook Ben enough to question his faith in the island’s powers that be and has ultimately driven him to ally himself with the good guys — or so it seems. In addition to being such a pivotal plot point, Ben grieved her death much longer and more deeply than, say, Hurley did Libby’s or Sayid did Shannon’s. And yet despite all the bad Ben did to Alex and how much the plucky and resourceful teen clearly takes after her mother, Alex’s death is preceded by an admission that temporarily delays her execution: “I’m Ben’s daughter,” she shouts to the bad guys who just gunned down her mother and boyfriend. No matter how much she hates Ben, she’s both his daughter and Danielle’s, and she probably had this thought it her head when Keamy put a bullet in it. 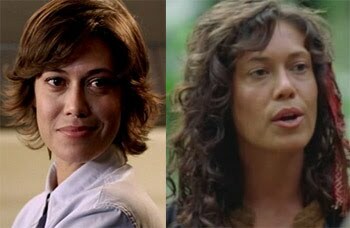 If her mother’s death was decidedly anti-climactic, Alex’s was one of the most moving yet on Lost. And both Lost’s writers and the character of Ben himself seem determined not to let her death be for nothing. So much more than a waitress in the sky: Cindy Chandler. Of all the inhabitants of the Lost universe, Cindy may be the one with the most unexpected character arc. Upon meeting her in the pilot, few viewers would have expected that this dispenser of miniature liquor bottles would end up becoming a battle-ready, jungle-savvy she-Rambo who apparently dedicated herself to the Others. But she did, and it’s been quite a trip. On the character’s Lostpedia profile, it’s noted that Cindy was actually supposed to die in the pilot, but the writers spared her when they realized that someone had to inform the tail section survivors that Flight 815 had been flying off-course before it crashed. I’m glad the writers made this decision, as doing so created one of my favorite supporting players. We may know little about her life before the island, but I’m nonetheless stoked to see where she ends up. As far as gender dynamics go, it’s interesting that she’s continued to play a nurturing role despite her transformation. Before the crash, it was her job to care for Oceanic Airlines passengers. After, she became a governess figure for orphaned 815er kids Zach and Emma. That’s about as stereotypically feminine as Cindy gets, and I like her all the more for it. Finally, with the next post, I’ll finish off this series for good. (I’d initially intended to include Penny, Eloise, Naomi and Zoe in this post, but even keeping the sections short, I realized I’d be better off spreading the content out.) Also: a conclusion? That can’t be right. I never reach those.